The San Diego City Council Tuesday unanimously approved a pair of leases to extend the life of Campland-on-the-Bay for three years and redevelop the former Visitor Information Center — both located at Mission Bay. 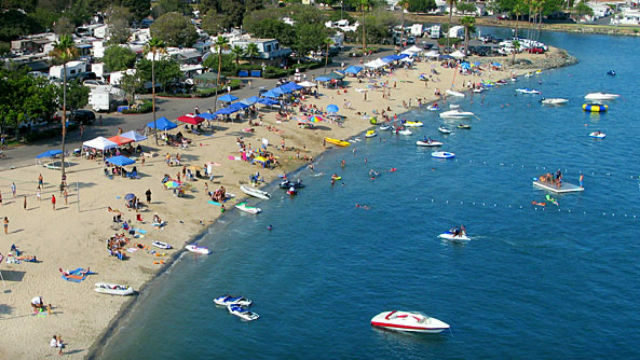 For nearly 50 years, Campland has offered public campsites, parking, boat slips, a general store and other facilities on the north shore, behind Mission Bay High School. Councilwoman Lorie Zapf, who represents the area, said it provides “affordable options” for families who want to spend a night along the shoreline, where other lodging choices can be expensive. Zapf said around three-quarters of those who visit Campland are San Diego County residents, not tourists. The long-range future of the facility is in doubt, however, because the city is launching a study on how best to revitalize 80 acres in the northeastern portion of Mission Bay at the mouth of Rose Creek. Planning could take at least three years for the area that includes Campland, the former De Anza Cove mobile home park and Mission Bay Golf Course. Rebecca Schwartz Lesberg, conservation director of the San Diego Audubon Society, said camping facilities could be moved to the other side of the creek. She said the environmental group supported the lease extension. The separate, 25-year lease for the long-vacant Visitor Information Center on East Mission Bay Drive was awarded to Shoreline Mission Bay, a hospitality services and design firm. According to terms of the lease, the company would have 18 months to renovate the 4,600-square-foot building on 2 1/2 acres of bayfront land before the 25-year term kicks in. The property can be used for an eatery, rental center for beach equipment and bicycles, and ticket sales center for local attractions. The company has proposed to invest around $3 million into the property, according to the city. Municipal coffers will receive a percentage of revenues from both Campland and Shoreline.